Rosa Rubicondior: The Christian Bigots Are Whining Again! More UK Christian whining and demanding privileges this week; this time over their right to teach children whatever they like regardless of the law. Following hard on the news that former Archbishop of Canterbury, George Carey, has authored a report demanding special treatment for Christians, including the right to indoctrinate all children with Christian dogma, regardless of their or their parents wishes, we have a demand by Christian faith schools to be allowed to ignore the Government-approved curriculum and Ofsted guidelines intended to promote respect and equality. Dozens of UK Christian faith schools are now following the American 'Accelerated Christian Education' (ACE) program which is blighting the education of the children of American Christian fundamentalists, rather than the government approved curriculum which is obligatory in all UK schools. ACE currently list 27 UK schools on it's website (accessed 22 Dec 2016). The 2010 Education Act require all schools to teach respect for LGBT people, to respect people's right to make lawful choices and to teach evolution in biology classes. The ACE indoctrination program however teaches that homosexuality is a choice and can be cure, that abortion is wrong, that AIDS can be avoided by following the Bible and that evolution is a lie. 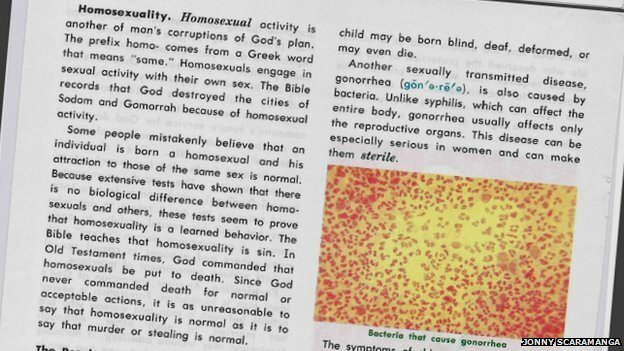 Concern has been repeatedly raised about the ACE program and a report in 2014 raised special concern about the ACE textbooks which teaches, amongst other things that God commanded homosexuals be killed. The school’s policy statement on personal, social and health education states: ‘Whilst we understand that the government has redefined marriage we will actively promote exclusive heterosexual marriage and celibate singles, as God’s gift and design; and as such the best way toward human happiness and fulfilment, but will discourage intolerance.’ This statement describes an approach that is too far removed from the active promotion of respect for gay and lesbian men and women. The proprietor must provide personal, social, health and economic education which encourages respect for other people, paying particular regard to the protected characteristics set out in the 2010 Act. These schools produce children who are kind, tolerant, interesting and go on to do good jobs. Most of all, they are happy. That is what Christian education does for them... Those not following the political ideology of Ofsted are now liable to be punished. 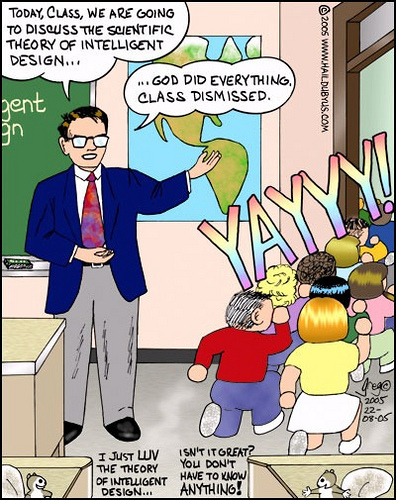 Ofsted is critical of the Christian belief system within the schools and yet it is this very belief system that is the foundation of schools across this country. In other words, the Christian Legal Centre feels that these ACE schools should be free to do as they wish because what they define as Christian values should superseded the 2010 Education Act and the Ofsted guidelines. They feel they and they alone should be the arbiters of British values which, so they have decided, should be based on a fundamentalist and literal reading of the Bible. If you have a few spare moments it really is worth reading through the Ofsted reports for the other ACE schools listed here. Ofsted reports can be found here. I'm afraid I have no sympathy for those who say that British values need not apply to them, that this should purely be a special test for schools in predominantly Muslim communities or our inner cities. Every school regardless, faith or none – should be promoting British values, because it’s the right thing to do. A commitment to British values means that we also hold to account those schools where girls are made to sit at the back of the class, where homophobia goes unchecked, where young people aren’t being made aware of the many facets of British culture. It's not often that I find myself in agreement with a Tory Minister. So once again we see Christians claiming the right to special exemptions and privileges based on the belief that somehow they are above the law or that the law of the land is wrong because it isn't in strict accord with their particular version of Christianity. There would be general hysteria in not just fundamentalist Christian circles but mainstream Christian circles and quite properly Humanist circles too, if schools were permitted to teach Children Islamic or Hindu principles and intolerance, including the idea that women were inferior to men or that the 'lower caste' had no rights and should only do the dirty and menial work. It's a measure of their breathtaking arrogance that fundamentalist Christians feel entitled to special provisions and the right to teach to a curriculum set by an unelected and unaccountable, American evangelical organisation. I'm in awe of the stupidity of 'so called' educators masquerading as 'scientists'. Let us be clear, science and the scientific method is inimical to the stolid dogma of religion. It irritates me more than I can express, in words, to consider ill informed folk who would try to impose their silly irrational beliefs on impressionable young minds. Frankly it make me incandescent with anger contemplating their utter stupidity.